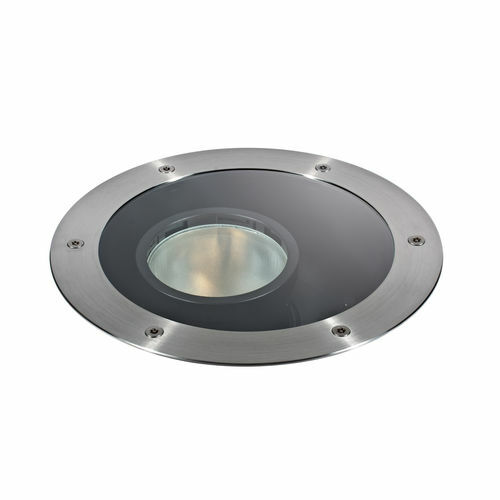 Recessed floor light fixture / LED / round / outdoor - KEPLERO ZOOM - Targetti Sankey S.p.a.
KEPLERO ZOOM Targetti Sankey S.p.a.
Anodized and black painted die cast aluminium body. Brushed stainless steel (AISI 316) ultraflat decorative ring with beveled edge. Extra clear protective glass tempered (thickness 10 mm) complete with silicone gasket. Anti theft stainless steel A2 Torx screws. 20kN resistance against static load. 20J resistance against dynamic load. Zoom optical system with the possibility of sliding and locking on the vertical axis according to four different positions that are related to four different beam apertures. The light beam can be adjusted up to 20° on the vertical plan and 360° on the horizontal one with integrated locking system. Optic group pre-set for the installation of one or more dedicated optical accessories to be ordered separately. Installation sleeve made of Nylon to be ordered separately as accessory. The sleeve is preset for a flush or straight edge installation according to the exigency. Electronic power supply IP68 integrated. The driver’s housing comes complete with dedicated IP68 waterproof connectors for the connection to the main with H07RN8-F (max 2x2,5mm²) or with continuity earth with H07RN8-F (3G2,5mm²) Ø7mm÷12mm MAX. On request the fixture can be supplied with a special anti-slip protective glass for public pedestrian areas. DALI electronic power supply available on request for minimum quantities. In line with International standard IEC 364-7-702 the IP68 rated projector can withstand temporary accidental immersion to a depth of 1 metre but is unsuitable for permanent underwater installation.